Learning Bach in the slopes of Mount Amiata. 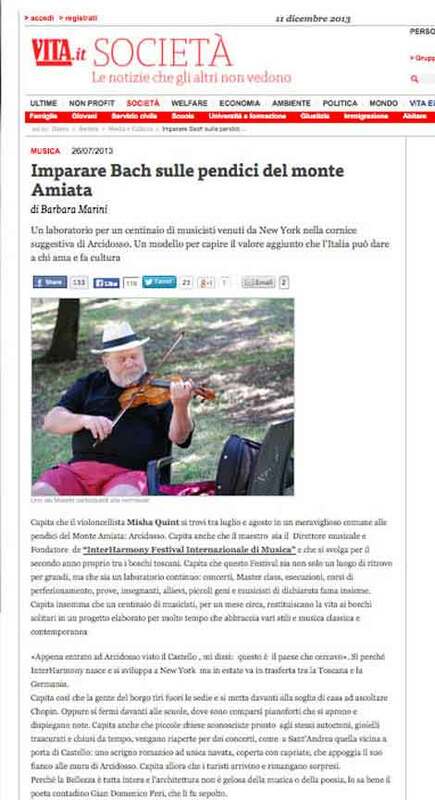 A festival for 150 musicians from New York in the setting of the picturesque town in Italy A model to understand the added value that Italy can give to those who love culture and makes It happens that the cellist Misha Quint is between July and August in a beautiful town at the slopes of the mountain.It turns out that the Maestro is also the Music Director and Founder of InterHarmony Internationally Music Festival, which takes place for the second year in the woods of Tuscany. This Festival is not only a meeting place for big names, but is also a continuous workshop with concerts, master classes, performances, specialty classes, rehearsals, professors, students, young geniuses and renowned musicians, all together. A hundred musicians, for almost a month, give new birth to the solitary woods in a long time elaborate project, which embraces various styles of classical and contemporary music. "As soon as I got inside Italy and saw the castle, I said to myself: 'this is the place I was looking for'". Yes. Because InterHarmony was born and developed in New York, but during the summer it moves between Tuscany and Germany. So, it happens that the local people will take their chairs outside their houses, sitting in front of the door and listening to Chopin. Or they will stop by in front of the school where pianos appeared and notes unfold. Small churches, unknown to the locals as well, jewels ignored for a long time, like that one in Sant'Andrea, which is close to the doors of castle: a treasure chest with a single, Romanesque aisle, covered with trusses, whose side lays on the walls. So the tourists visit and are mesmerized. Because there is a whole beauty and the architecture is not jealous of music or poetry, and the poet farmer, Gian Domenico Peri, who is buried there, knew it very well. And so, it also happens that the Chairwoman of the cultural committee of the town, Roberta Pomoni, without money, other means or even without a press agency, instead of complaining about the not broad-based coalition, she will works hard in order for the festival to take shape, and she does it also with the willingness and satisfaction of seeing her village come to a new birth, and people question themselves and collaborate with contentment about the beauty of what is happening. One often sees the chairwoman setting the chairs in and outside the theater before the concert, or staying for dinner with the musicians. It also happens that an entrepreneur of tourism like Marco Paglialunga will host the participants of the Festival and take care of them in his Hotel Colle Degli Angeli because artists need to sleep well and eat better, and it seems that the delicious cuisine of Tuscany is really helpful to make a great performance. Yes, because when the political delegation and the business community join together to promote culture it happens, something strange can really happen from the small local communities of our tired peninsula, and can still magically create something that will drag all the artistic realities into one spot, which came back to life from the anonymity in which we cast. It seems that this union looks like those dancing elves in the Shakespearean woods, which are hidden to kings, powerful people, and sponsors and to the summertime gossip culture. In other words, it happens that in those midsummer nights what seems to be a dream will actually turn into reality. And if you lost these musicians up until today you can listen to Bach "Brandeburg Concerto No.3" on July 27 performed by 10 solo students, and then Donizetti, and Saint-Saens, in an intense performance of Misha Quint, which will close the Festival. And if you're really far away don't miss next year's edition, which will be even richer in events.